Check it out! A Motorcycle! I know, I know....I go over this again and again here on this blog, but it truly bears repeating: Electric-assist, "e-bikes", electric bikes, or by whatever name you call them, these are really primitive motorcycles. Motor + Bicycle = Motor-cycle. Why is this so hard for people to grasp? I don't know. The whole marketing schtick behind these vehicles with electric motors is that somehow, some way, they are bicycles. I completely reject this idea as being wrong. Bicycles are a human powered machine. (Note: No mention of any "assistance" or motors.) In fact, I would go as far to say that the electric motor equipped, two wheeled vehicles being foisted upon the public are really just poor excuses for motorcycles and a throwback to turn of the century motorcycles circa 1900. Hey Look! A Gas Assisted Bicycle! That's right. A bad motorcycle. 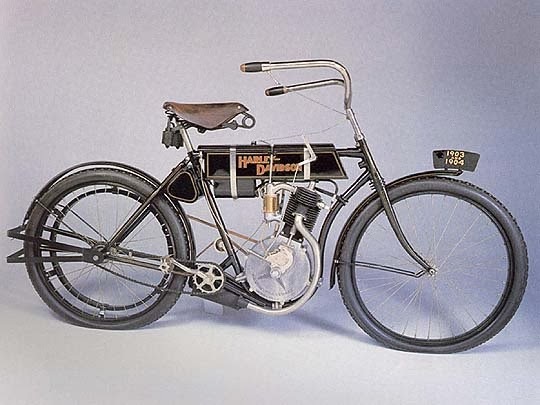 Check out what the earliest Harley Davidson motorcycle was all about back in 1903. It was mostly based upon bicycle technology, but everyone understood it wasn't a bicycle. Why? Because bicycles are and always have been completely human powered vehicles. The subversive/rebellious angle is certainly one reason. I've said it before here: Folks that are into this like the fact you don't have to license these, get a license to operate them, and that you can go where other motorized vehicles cannot go. They masquerade as "bicycles" when really, they are anything but a bicycle. I would say they are the antithesis of bicycles on many levels, but that's another post for another day. 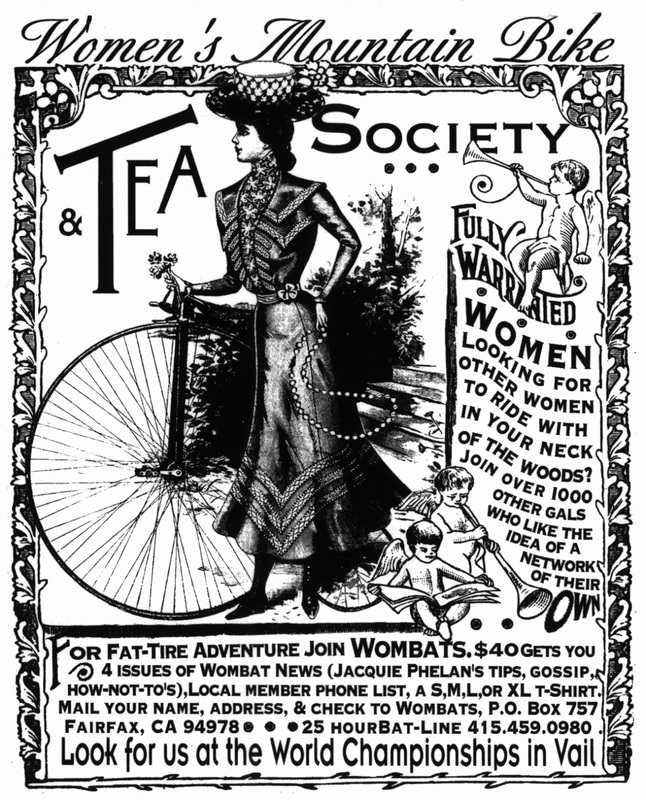 Maybe if you give a rip about history in the bicycle realm, you know that Jacquie Phelan used to do a women's mountain bike skills.......club? Organization? Seminars? Well, she did this "thing" that was supposed to help women out in a male dominated sport to become skilled in off road bicycling. And she did just that for many, it seems. She was the first, to my knowledge, and possibly ahead of her time. Well.....she was ahead of her time. Truly a pioneer there. "With more and more bike parks opening around the world, the timing is perfect to start this business. Leigh (along with other extraordinary coaches) will teach women riders how to do it safely and give them the tools they will need to be more confident when riding the trails." If you are in SoCal, her first big three day deal will be at Mammoth Mountain July 23-26, 2014. So there ya go. Leigh is following in the trail cut by Jacquie, and hopefully this is a successful deal going forward. You know, they say that "if you don't like the weather in Iowa, wait five minutes". 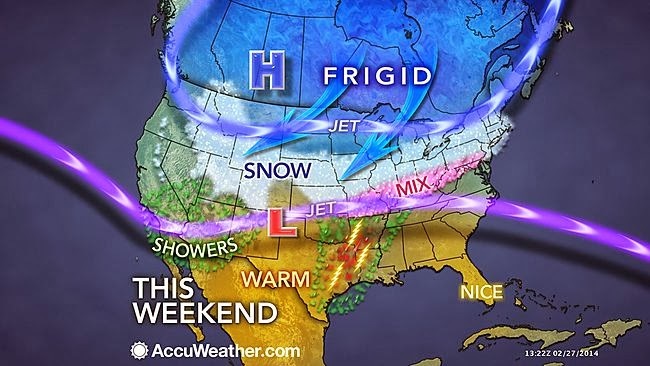 I feel this needs to be amended to "if you don't like the weather in Iowa, wait five months!" Okay, it hasn't been frigid for five months, really, but it has been frigid for a longer time than I can remember in recent years. Maybe since I was a kid. It's been getting to the point now where folks are seriously being affected in a negative way around here. I knew it was jacked up when I was reading about the Iditarod Trail Invitational and they were complaining of rain and temperatures in the 40's above zero! That's in interior Alaska folks. That's not right! It's been too warm in Alaska all Winter too. Well, that's a warp for this week. I hope you all can get out and do something this weekend. Keep the rubber side down! I can write the ol' fashioned way pretty fast, but digitally? I am a terrible typist. Really, really bad. You might be surprised to know that, considering the blogs and written work I do. It is kind of ironic. I remember when I first started writing online for Twenty Nine Inches. The founder of the site, who had asked me to contribute some content, was wondering one day what was taking me so long to post a certain story he was anxious to have up on the site. Back then, it was all about speed, and exclusivity that getting stuff up before the endemic media gave the site. I told him I was still typing it out, and I had been doing so for over an hour. He was incredulous. How in the world could I be so slow? Of course, I had a typing class in secondary school. We all had to take it. It lasted a semester and took students from nothing to fast, competent typists. Well.......except for me, that is. I never really ever caught on. I recall that we had competency tests every so often. You could only be scored until you made three mistakes. Generally I was incapable of getting past ten words before I made three mistakes! Sometimes it only took one word. I felt pretty bad about this, so I cheated. I would take the mechanical arms and press them by hand for each letter ahead of the "go" signal to get as many words on the page as I could with no mistakes. Even doing this, I could only manage a personal best of 21 words a minute. Yep, I was a miserable typist back then, and I've not improved much since. I resorted to the "hen pecking", two finger approach, and it has served me well over the years. Well, I don't make so many mistakes, but it is slow and tedious work. To give you an example, I sent about 140 e-mails yesterday to the Trans Iowa roster and volunteers, plus a few extras for other reasons. Even with a "cut and paste" approach to the letter's body for the Trans Iowa stuff, it took over four hours to wade through all those e-mails, and that's without a break. I should have timed how long it took to type this post, but I'd only get depressed! Whelp.........I am wheeless. On the titanium Mukluk, that is. The Velocity Duallys had to return back home, and I had other ideas anyway. Big, floaty ideas. Not that I didn't like the Duallys, because I did, but my priority wheel set has to be a big, fat, ridiculous one. Why? Well, I am tired of punching through and being in an unstable situation on the blasted, drier snows, like we had to ride at Triple D. So, I have this plan to set up some 100mm Clownshoes with some Vee rubber tires. But first, I needed to get some hubs. Those hubs should show up today. Purple hubs. Salsa Cycles purple anodized hubs. They are convertible from quick release to through axle, so if these go to a different bike, it's no problem. You may say, but aren't those front hubs a front disc spacing?, and I would say, "Right you are". Still no problem, since I can get an adapter for my rear spaced front fork. Going forward, if I get another fork, it would most likely be front disc spaced, so I would be good there as well. So anyway, the first piece of the puzzle arrives today and I will be slowly making my way toward getting a big, wide, expedition worthy wheel set up and running for the titanium Mukluk. Now if I were to be racing more, I would get a Dually wheel set. Those are sweet for that purpose. The thing is, the Triple D, which is pretty much the only fat bike race around here I am interested in, isn't done on a groomed course. 100mm rims and big tires are overkill anywhere else races are held around here. The Triple D would be a suitable event for the big fatties, but otherwise I am not doing any super-groomed, fast, hard packed trail on my fat bike in a racing situation. Why? Because lap races on groomed courses is so 1990's. My opinion, and it isn't what I think of when I think of fat biking. Many of you might enjoy that sort of thing, and I think you should go do that then. It just is not for me, that's all. Besides, I don't ride a fat bike to be out racing anyway. In fact, I like it for quite the opposite reasons. I do like lighter weight, high performance parts though. The thing is, I just don't see the value in going with carbon fiber rims for a bike I am not going to be racing on. The Clownshoes are fine for me. Yes......they are heavier, but they also cost a heck of a lot less money, and for the times I will want to be using them, cost is a consideration. Weight is way down the list of "needs" for this project. Besides, there are no 100mm wide carbon rims........yet. Sarma is coming out with them, but their 80's cost over a grand a pair already. Nope. Not gonna go there. Now for tires I am going to probably slap a Snowshoe on the rear and a Snowshoe, or an upcoming Vee Rubber tire that isn't out yet, or a Bud on the front. We'll see there when the time is ripe. There may be an offering from Bontrager, or others, before Winter comes back around here and I need such monster tires. So, what will I do with the bike until then? Why I will slap on the "skinny" wheels, that's what! I did this back in 2012 and I really enjoyed the Mukluk that way. It rode really well, albeit more like a "touring" set up. I don't mind that at all, and actually, for casual mountain biking, just to see the sights, it was fantastic. This will make it so I have a good geared hard tail with a flat bar set up. I have the Fargo Gen 2 with the drop bar, but no other geared, flat bar hard tail. Ironically, back in 2012 I was trying out a bike packing set up, but now that I have the Bike Bag Dude's frame bag, seat bag, and Chaff Bags, I am set to go in that way. 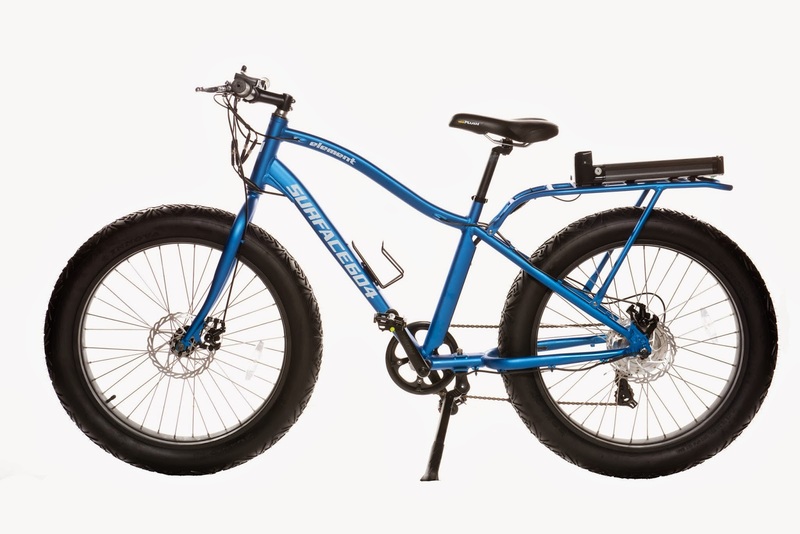 I already told my son that we're going camping this Summer, so we'll be taking his fat bike and mine will be there with the "Summer-set up". So the Winter "big wheels" will be slow in getting put together. Winter is about shot here, (really......just you wait and see! ), so no hurry to get them done just now. I figured I may as well get started on next year now though. I stopped first at the Surly booth, because I knew they had that monster fat bike, the Ice Cream Truck, and I figured I'd get that out of the way first. I ran into Tyler Stilwell, the master of marketing disaster at Surly, and he showed me the ropes. The coolest rig in the booth was the Karate Monkey refresh. No more funky track ends. No more antiquated 1 1/8th straight steerer. And check out that tinted clear over raw finish. Nice. And while it is a cool upgrade to an old classic, one has to wonder if it is enough to do that only. There are so many great hard tails now that the Karate Monkey seems a bit lost these days in the white noise of everything else around it. Even Surly's own line up boasts more interesting bikes like the Krampus, ECR, and Instigator. Throw the "everything but the kitchen sink" Ogre into that mix and one has to wonder why this bike, or the long in the tooth 1X1 still hang on in the Surly catalog. I could see this bike being a bit fresher with a geometry tweak, but Surly didn't see fit to do that here. Finally, the Ice Cream Truck. Hmm.......this should have happened when they did the Moonlander. Other than this, I don't see this as ground breaking, besides the fact that it signals a break with past Surly traditions. An Instigator with a fat front fork and 26 X 3" Knards. The funny thing is that yesterday I really could have used a studded fat bike tire. We have sheets of glazed ice everywhere in town lately. Bah! But here's the deal: $250.00 bucks a pop? (Dillinger 5) Ouch! I'll take my chances for $500.00, Alex. That's too rich for my blood. And you get a tire rated for......tubed usage. Lame. You know, the Dillinger 5 will sell out, and probably will be a sought after tire, but I can shod my entire fat bike with Vee Rubber tires for the price of one Dillinger 5 studded tire and the Vee Rubber tires are tubeless compatible. Surly has nothing much better either. Then I moved on and talked about gravel road tires with a few folks. I found out that not one, but two companies are seriously working on tubulars for gravel road use. Big tubulars. 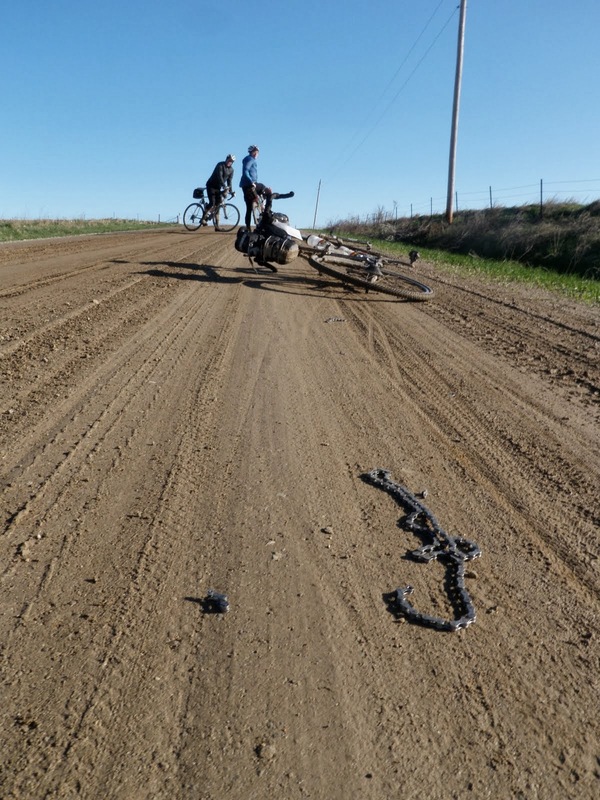 Now, I get why the tubular seems to be a great solution for mountain biking and gravel road riding. Basically eliminate pinch flats, supple, smooth, comfortable ride, high degree of traction with low rolling resistance, can be ridden flat, etc. However; I noted two things about this idea that still need work. Rims and tire failure in the field. Oddly enough, the solution for both issues may lie in a single specialized product. Special rim tape that is pressure sensitive. WTB announced the Nano 40 tire just ahead of Frostbike. The Nanoraptor is an awesome tire for 29"ers and is fast, light, and comfortable. (When made in the right factory, but that's another story.....) The Nano 40 will come out late Spring, most likely, but I found out a TCS, (WTB's tubeless ready, UST based system) version will be coming later. 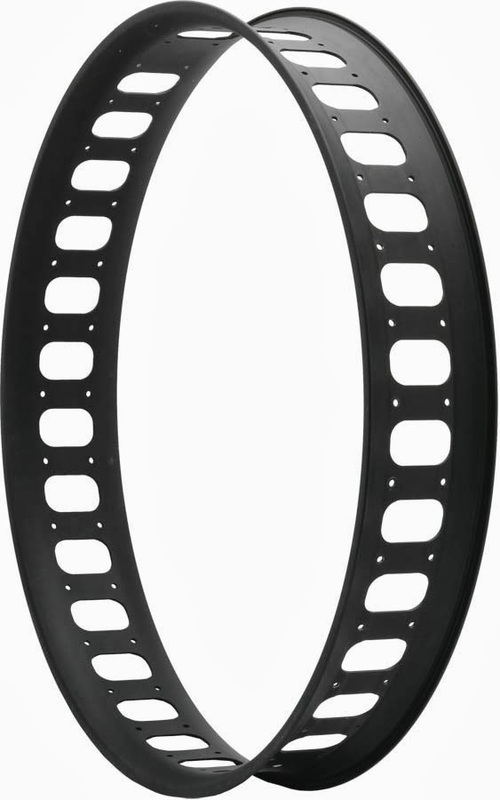 WTB already has a disc and rim brake 700c TCS compatible rim brake models available today. There's the beginnings of your gravel road based, tubeless ready, proven system. Oh, and......Hey Surly/45NRTH! Take notes here........ Fat bikers deserve to get the same for the high dollars you ask for your products, don't cha think? I sure do. Moving on, I saw some promising ideas for gravel road clinchers and tubeless ready tires and rims were talked about as well. So the other companies will be doing some cool things coming in the near future. This is Anna Schwinn's Light, Strong, and......Pretty drop out. I love Anna Schwinn. Really. She's a very interesting person to chat with, and she's designed a drop out that solves an issue I have cussed about several times. The track ends with disc brake deal. Drives me nuts. I hates it, I do. We hates it forever! But here comes Anna's cool All City drop out to the rescue with an ingenious design that moves the IS brake adapter along with the rear axle when you turn the adjuster screw. Beautiful, strong, and light, (so says Anna, and I chose to believe her), this makes living with an All City Nature Boy disc model that much easier. Other companies take notes, please! Tim Allen's new bike. He's a National Champeen, ya know. Foundry Bikes. Oh the brand with the ironic name! All plasticky bikes with a name that screams "metal". (Not as in "Motorhead", but as in the ferrous, 4130 meaning.) I never quite figured out where the heck they were going with that schtick, but anyway....you could never tell a Foundry from a Chinese direct frame. The "low key branding" thing just didn't work with the all blackness thing going on in carbon fiber. Well, now these rigs are painted. At least you can easily pick out the ironic name of the bike now! They should change the name of this brand to "Chemical Stew", or "Autoclave". At least it would fit better. Besides that, the bikes are straight up cyclo cross screamers. Don't think about putting anything bigger than a legal sized CX tire in the back, because you won't have any mud clearances. It's tight back there! A word about Mr. Allen. He won the CX single speed national championship, I guess. You'd never know it by talking with him. A great, down to Earth, humble fellow. He was truly stoked to be getting the bike pictured here and to fly the Foundry flag. It was genuine. The thing about meeting him was that I didn't realize "who he was" until afterward when someone pointed it out to me, so I had no preconceived notions there. 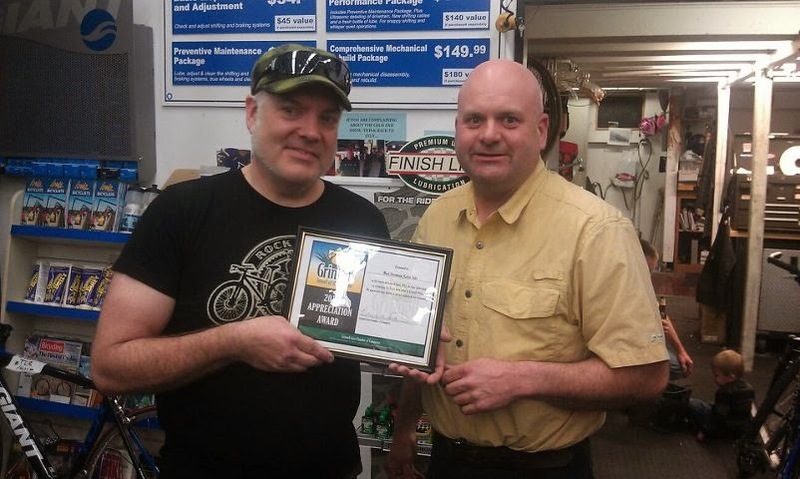 Another good moment or two was had when I was able to present Jeff Kerkove with an "official Trans Iowa v10" shirt. I thought it appropriate that he get the very first one out in the "wild" to wear or use as an oil rag, if he so chooses! I don't think that he will, of course, and he seemed truly stoked to get it. I think he was genuinely struck by the fact that this upcoming T.I. is number ten. 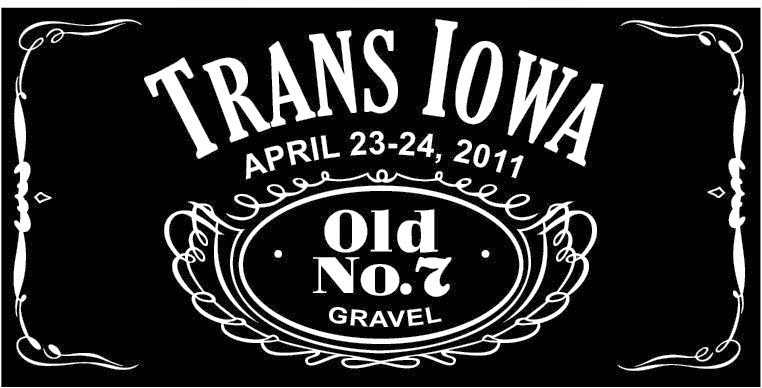 I know we were pretty amazed that folks wanted to do Trans Iowa a second time after we put on the first one, much less having it last ten editions. So there were several other conversations with several other folks I don't get to see all too often. Some Trans Iowa veterans and finishers, some others that have been reading this blog or one of my other sites, (thanks, by the way), and then I looked at my watch. Dang it! I missed lunch again this year! Oh well........Onwards through the fog! I ran across Jason Boucher. He and I got to know each other back when he was the Salsa Cycles brand manager. Now he's moved on up the "Q" ladder. We stood and chatted for a good long while. I really enjoyed that. Then he asked if I'd seen the Trans Iowa tribute in the Salsa booth. I hadn't. So I walked over to check it out finally after the show was clearing out for the day. I have to say that I thought it was really impressive, well done, and definitely humbling. You know, I never planned on having all this attention on Trans Iowa, and even now I am still kind of shocked when I see people making a special effort to express something in print, on film, or in the digital realm that concerns the event. I know........it means something to a lot of folks, I get that part. Heck, it hasn't gone unnoticed in my life that it means some things as well to me personally. However; to see it at a trade show expo........ I never woulda thunk it. Then there were beers, some vittles, some Korean food at Hoban, then nighty-night. The next day I made a brief appearance back at the show, then I had to skee-daddle back to the home base. It was a good Frostbike, but a different one. No Mike's Bikes, less shenanigans, bad weather, epic travel, and lots of great friends and acquaintances. I'll have a bit more to say about Frostbike elsewhere, but for here that's a wrap. Thanks to the Witt Family, QBP, all the friends and acquaintances, and everyone that made Frostbike possible. As I watched the storm develop on Thursday, I could see that heavy rain had pushed up ahead of the cold side of the system and later it turned into snow. Here in town, I listened as all night long the wind rattled the rafters and it sounded really wicked out there. We were to leave Friday about noon to drive up to Frostbike, where I hoped to catch a party at a motel that afternoon for the QPB brands and dealers showing up for Frostbike. Here in town we received very little snow, but a sheet of ice had formed over the side streets. We packed up the vehicle and headed out of town, and at first, it wasn't bad at all. I was in contact with Ben Witt, my friend from Northfield Minnesota, and he told me that the interstate highway was closed in Minnesota due to snow. I guess that they received far more snow up that way, and that blizzard conditions had prevailed overnight. I decided to cut off that section of Interstate 35 by going up Highway 218 instead, which, if I was right, would bypass the closed section of interstate entirely. As we went further North, things got progressively more icy and snowy. Heading up Highway 218, it was getting downright treacherous. The highway was completely covered in snow, and speeds were about 40mph at the top to keep us safe. There were very few cars on the roads! We reached the town of Osage without incident. I was noticing how it appeared that the folks there were just getting around to digging out. Hmmm......not a good sign! The winds were stiff from the Northwest at 20-25mph with higher gusts. Up north of Osage, the drifts were immense. We met a road grader with a massive "V" shaped plow that was ramming through 10-15ft high drifts to allow for the passage of cars and trucks. At one point, it was a one lane passage through, and the snow was so deep that I feared we would get bogged down and stuck, but the Highlander pulled through it. Not long after, we hit the remains of what the maintainer left behind after punching through another huge drift, and the car started getting sucked to the right toward the big drift, which at this point was taller than our SUV! I cranked the wheel hard left, let off the gas, and the vehicle traveled more or less straight through, saving us from getting stuck. One more of those and I would have turned back, but that was the worst of it, as far as drifts went. Onward to the North, we were going 20mph at times due to the wind, blowing snow, and ice-snow covered roadway. Finally we reached Austin Minnesota, and crossed Interstate 90, but immediately we saw a "Road Closed" sign, and a long line of semi-tractor trailer rigs lined up waiting to get through. Check! I told Mrs. Guitar Ted we would try going West on I-90 at that point, so we doubled back and went down the on-ramp. There was no signs that this was a closed road, but in fact, we found out later that it was. I should have guessed, since it was largely a deserted stretch of road, which is highly unusual for any interstate highway in the Mid-West. We reached I-35, and although I suspected it was closed, as Ben had warned, there were no barriers, no officials to stop me, so I took the right hand on-ramp to I-35 and continued Northward. It was super sketchy until we got much closer to Northfield. Normally, it takes me about 3 hours or slightly less to get from my home to Northfield, but on this blustery day, it took over 5 hours. We checked into the motel we were to stay at for the weekend, and I was so tired and stressed out from the drive that I crashed on the bed for several hours only to be awakened later by Mrs. Guitar Ted to go have Mexican out with the Witts. Afterward, a few beers with Ben and Marty at The Cow, a bar in Northfield. We couldn't do the usual Mike's Bikes gig, since our chaperone was out of town. But that was okay, because I wasn't too up for anything but a couple IPA's and more sleep anyway! This will be the final installment of this series. Thanks for all the kind compliments about it and for reading them. With V9, we had a lot of hoopla. Three sets of roaming photographers, an award from the Grinnell Chamber of Commerce, and the Trans Iowa radio set up. We had a record 91 starters, a record Womens open field, and folks riding in the event from the U.K. 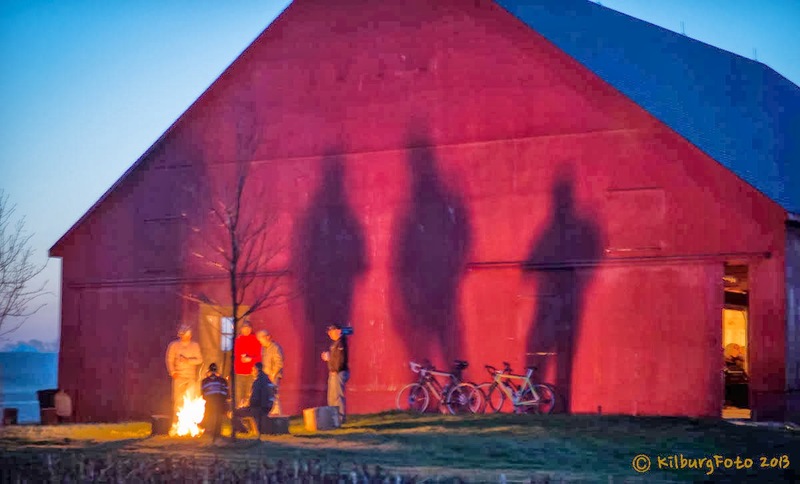 The Barn thing was all set to go, and to top things off, the weather could not have been much better. Even the wind was (mostly) a non-factor in the event. 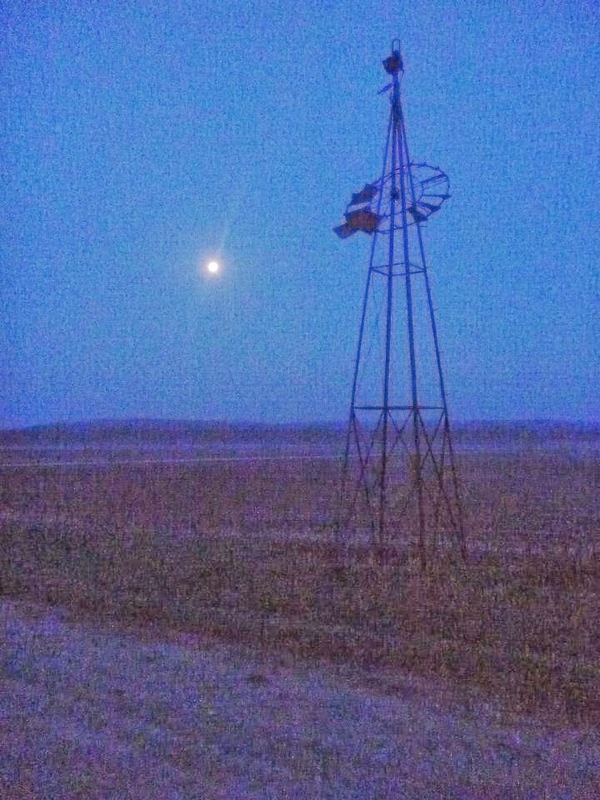 The nearly full moon was riding high in the sky at the start and there was a thick blanket of fog in the vales and valleys of Jasper County which made for a scene that produced a slew of outstanding images of riders and the countryside. It was almost impossible to get a bad shot that morning! I remember stopping high up on a hill on E. 84th Street N and just sitting there for several minutes soaking it all in. I hadn't had the luxury of being in that sort of position before, and I took full advantage of it. It was totally a result of my lessons learned over the years of doing Trans Iowa that allowed for that. In fact, I stopped twice more. Once to chat with fellow Trans Iowa fans and photographers Wally and George, and to chat with my friend Jason Boucher, who also was there on official photography business. Then again for a good look at the Sun rising over a Jasper County hill. Trans Iowa at this point was a dreamy day out in the Truck With No Name for me, but that would change past my visit at Checkpoint #1. We had a leader's group came in and they took the wrong direction out of the village of Ira because they did not check their cue sheets. So I went blazing outta there in the truck to head them off at a place where the bike path crossed the course West of Ira. Fortunately they realized what had happened and turned back before I saw them. I figured things would go back to being calm then, but I was wrong. The weather was good- too good- and I figured on more attrition at Checkpoint #1 then there was. My checkpoint folks were running out of cue sheet sets to Checkpoint #2! Fortunately a few clearer heads than mine were able to sort the matter out by finding a copy machine to borrow in the tiny village. Crisis averted, but a lesson learned yet again. Then things really did quiet down. for the most part, the rest of the event was kind of boring from my perspective as far as any "adventure" went. No silly B Road antics in the truck, no big problems at all with the event. I did have a "whiskey spill" that required some hasty clean up and drying out of the waivers, but other than that little aside, Trans Iowa V9 went off without a hitch. We had a record 35 finishers and a first time single speed women finisher and a first time for a women with two finishes in Janna Vavre. The finish line scene for T.I.V9 was one of the most memorable and impactful for me. I suppose having twice the average finishers was one reason why. Another was that it seemed that a lot of the finishers were really emotionally charged and showed it at the finish. Steve Fuller stands out in that regard. Epilogue: With that I conclude the look back at ten years of tales concerning this gravel road event. Obviously there were a lot of twists and turns coming up to this time and the impending running of T.I.v10. Even more obvious is the fact that this series was just my take on things. There are other opinions, views, stories, and thoughts on Trans Iowa out there and they may vary a bit in their telling of the story. That said, this is my experience as I remember living through it. Trans Iowa has gone from an event I was just a helper in to becoming a big part of my life that I have a lot of passion for. Trans Iowa has gone from an idea that was mostly Jeff Kerkove's in the beginning to an event that I have made into whatever ya want to call it! I hesitate to quantify what that is for anyone else! I am, on the one hand, all finished with this event. It has been a huge tax on my family life and we won't even get into the financials and what not that went along with putting on this event through the years. I want to spend time with my son and daughter before they grow up and leave the house. On the other hand, I want this event to go out on a good note, I want to keep seeing the folks that have come, and how they are changed by this event. I want to keep providing the chance for that, if I can. With the end of Trans Iowa V8, I could have walked away and been satisfied knowing that I had done the best job of putting on a Trans Iowa I could have done. Afterward, there wasn't any glaring issues to my mind concerning that. Of course, this precludes any feelings and thoughts I may have had, (and still do), about the friends, riders, and the event itself, which were and still are compelling and strong. I still had lots of support after the event for doing another. Grinnell wanted me back again, Wally and George were up for it again, and Jeremy Fry, a Trans Iowa finisher and volunteer, was up for being a major helper in regards to doing recon and cue sheet checking. I also had tweaked out the event to the point that a system was in place that was easily repeatable and reliable. Logistical details, formatting, rules, and execution of all of those were things already figured out over the years. No more efforts in thought needed to be put forth, no more extra efforts in materials or physical effort were wasted. So, with that all in mind, doing a version 9 was a lot easier to decide to do than, say a version 4 was, when there were a lot of things that needed to change. To tip the cycling cap to the two time Trans Iowa winner: CP#1 location. There were a few minor things to tweak out none the less. I decided to do away with the pesky, frustration of the Waiting List by increasing the field size to 120 folks from 100. Figuring on the "T.I.V3" effect, where we let in 128 and got 64 to show up, I was thinking that the overall final number of riders would still be about the same as ever- that being in the high 50's to high 60's in number. I also knew that if we did get a higher number of riders that the performances of the volunteers over the past few Trans Iowas was sufficient to handle the flow of riders, especially through checkpoint #1. Volunteers were submitting their services for T.I.v9 as soon as I announced it on August 18th, 2012. Secondly, the recon was streamlined a lot. 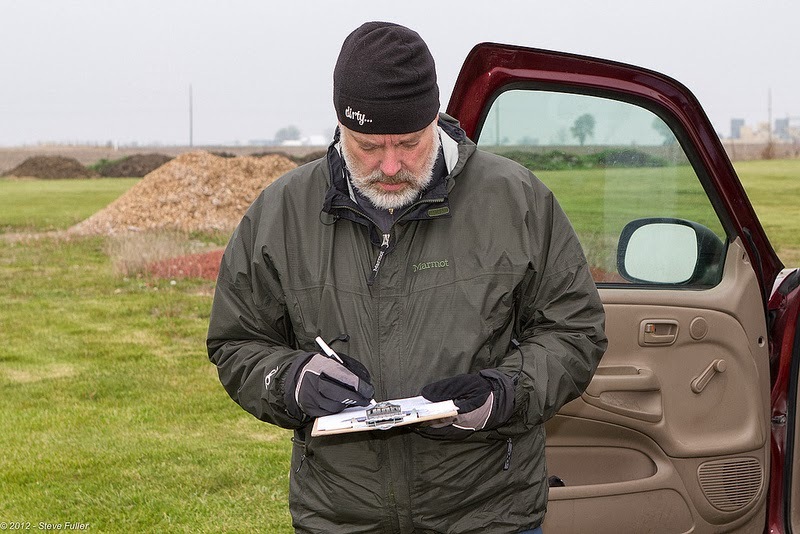 Essentially, with the efficiency of having Jeremy involved and with the notations and maps to guide in the physical recon being done ahead of time, as I learned was valuable the previous year, we knocked out the recon in two drives. One in October and one in early December. This was instrumental in allowing for us to recheck actual cue cards ahead of time, and then to do the last physical recon in the Spring of 2013 with Wally and George. They used the actual cue sheets to drive by, which then they judged to be clear, or not, by the way I had them written. The second recon was marked by fog, a portent of things to come. The barn proposed as the finish line for V6 was now again going to be used as the finish line for V9. Plans were set in place and the ending of the route tweaked out to reflect this. I was really hoping that the weather would hold up so the riders would actually be able to get there! A change with Grinnell came along as I discovered that Sheryl Parmely, the person I regard as instrumental in cementing my allegiance to Grinnell and having Trans Iowa based there, had left the Chamber and had been replaced by Rachael Kinnick, so there was a bit of uncertainty there with how things would go with the city. Trans Iowa Radio was also going to be a bit different for V9. "Mountain Bike Radio" founder, Ben Welnak, offered up his services to make it possible for not only me to call in reports, but for any of the riders to call in and have Ben post the reports, ala Tour Divide, so folks could get access at home to what was going on from several points of view. But beyond these minor things, I experienced no big road blocks or bumps in the road going into Trans Iowa V9. The obvious uncertainty of what the weather would do was the only real question mark coming into this one. With all my efforts focused upon putting on the best Trans Iowa I could, a few things bear mentioning that were unusual for this event. First amongst those is the film, "300 Miles of Gravel", which would be shown for the very first time during the Pre-Race Meet-Up. 67 riders and support folks were the first to witness the unveiling of Jeff Frings' hard work over the past year. It was a bit embarrassing for me, having had a big part in the show, but it was well received by all in attendance. Secondly, the remote nature of the course was such that convenience store opportunities were scarce, and nearly non-existent for the last 140 miles. 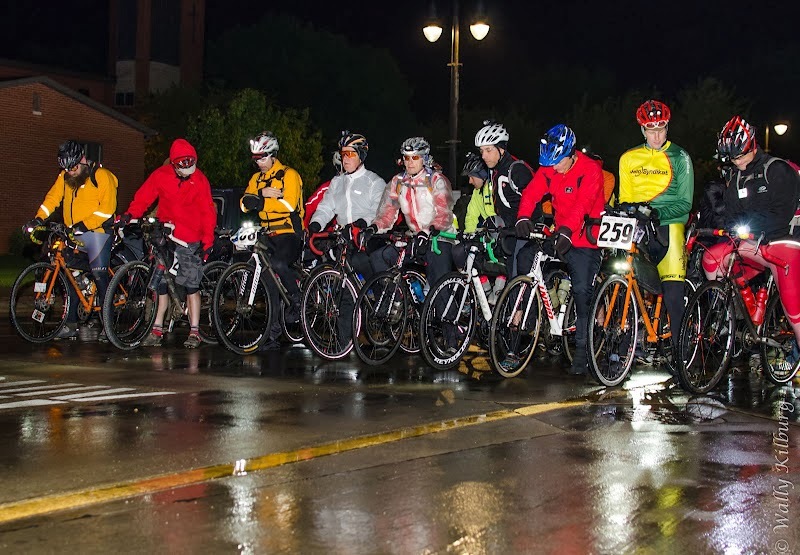 Because of this, and the fact that I had Gu Energy and Cliff Bar downloading tons of product on the event, I took a page from the Pirate Cycling League's Gravel Worlds and used their idea of a "Secret Checkpoint". What I did was I picked out a spot in a small village with about 120 miles to go and allowed volunteers Jeremy Fry and Matt Gersib to provide whatever goods they wanted to, along with the Cliff Bar and Gu Energy stuff. Then there was the remote 2nd checkpoint, which was really way out in the sticks this time. I think the nearest village was 10 miles away! (Not on the route either, by the way.) I really liked this particular checkpoint and fortunately the weather cooperated to allow for it to be a great part of Trans Iowa V8. The Trans Iowa vehicle would finally be "The Truck With No Name", since I had no co-director anymore. It would be just myself slugging it out for 35 plus hours. Media: We had Steve Fuller pulling photography duties again for V8. 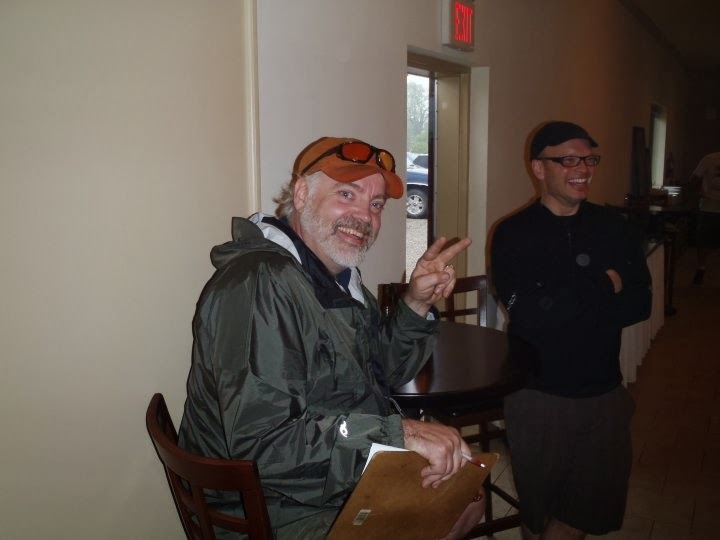 He along with Checkpoint #2 volunteer, Wally Kilburg, took a lot of great photographs before and during the event. Trans Iowa V8 has a ton of photographic documentation, possibly more photographs were taken for V8 than the previous seven Trans Iowa events combined, at least on a "professional, for the event" level. We also had Dave Mabel with "Iowa Momentum Magazine" as an "in race reporter". The weather was crazy. It had been bone dry leading up to T.I.V8, but the night before we started, thunderstorms let loose and stayed around till right up to the start. It was super windy from the east as well. I awoke in my motel room at 2:30am. So, a too early start for sure! I was nervous about the weather, and nervous about how it would all go down, excepting that I knew that everything I could have possibly accounted for had been covered. Not like any Trans Iowa before V8. My main memories from the beginning were the lights, as always, of the long train of riders. I recall stopping for a moment on a hill to watch their glow coming up behind me and then like a small, brilliant bluish sunrise, the lights spilled over the lip of a hill behind me. That was cool to see. 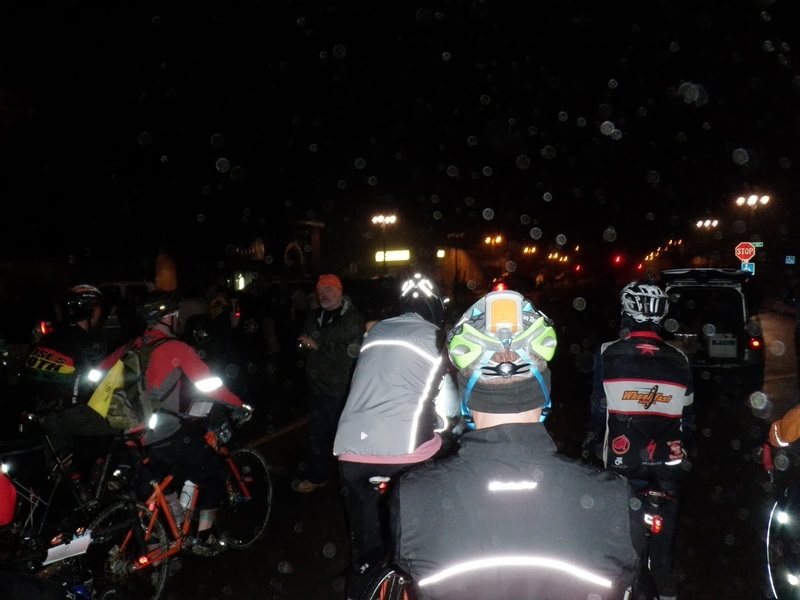 Then it was the wind, darkness, and me feeling very alone as I struck out to the first B Maintenance road 29 miles into the event. Things went well, actually. Typical Trans Iowa stuff from the start through to Checkpoint #1, just without any drama whatsoever. No rerouting, no miscues, nothing like that at all. It was almost.......boring! Checkpoint #1 was well manned and executed by the volunteers led by Brent Irish. Kudos to that group. They were top notch volunteers. Again, things were going great, and better than I thought. I was pretty down in the dumps about the weather, but when Brent Irish called in with the Checkpoint #1 figures, I was dumbfounded. Brent: "It looks like we had 55 go through the checkpoint." Me: "How many?!! Are you sure?" Brent, (sounding a bit annoyed), "55- By my count we had 55." I explained I was not questioning his abilities, but I was surprised to the point of flabbergasted. It was a big turnaround for me in my countenance and I was excited once again. Further up the road, Wally and George put on a heck of a checkpoint experience, with a great atmosphere, camaraderie, and even a fire to warm a cold body beside! I still remember John Gorilla telling me that there should have been a time limitation on how long you could stay at Wally and George's checkpoint! 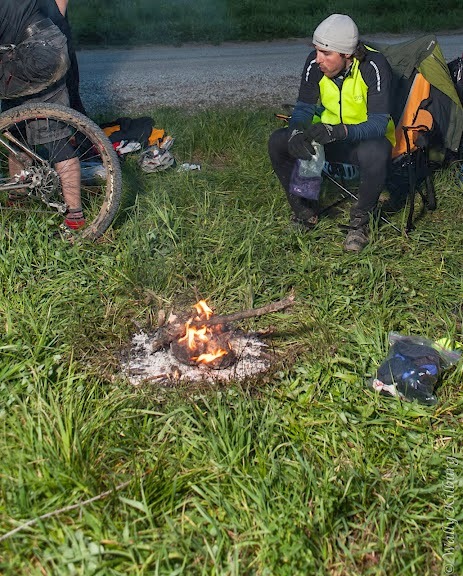 Checkpoint Bravo and the campfire. Going to hang out with MG and J-Fry at the "Secret Checkpoint" was another highlight point in the event from my standpoint. Good times there. Then moving up the road, there was the trouble with finding a good place to pull over to urinate. Yeah, when you are in the country, there usually are several places to discretely relieve oneself. However; I could not seem to find a place out of sight, or find a desolate, car free enough area to get out to do my business. I recall pulling into Pella and finding a bicycle trail that the riders were to take into town. There was a public trail head there with a parking lot. Surely there would be a public restroom facility, a porta-jon, or a pit toilet? Nope! Nuthin! I didn't want to stray to far from the trail for fear of missing the lead riders, but I eventually found a line of trees and brush to hide behind and this was a life saver! Then there was the late night driving in Jasper County on their freshly graveled, loose roads. I pulled over to take a call from MG and the truck just about slid into the ditch! Of course, I had already, earlier Saturday, done a full mile of squirrely B Maintenance road dirt trackin'! Some folks that knew about my near misses were concerned afterward and asked me to consider having a ride along partner. But why would I put someone else at risk? Heck, I still am going to be pushing up against the edge while driving regardless of who is in the truck! There really was only one tense, not very pleasant time during all of Trans Iowa V8 for me personally, and that was when we realized that Charlie Farrow was AWOL in the night. At some point between Checkpoint 2 and the Secret Checkpoint. Remember- he had gone off course already once before CP#2, and my mind was reeling with the possibilities for a not so great outcome to this development. MG said he'd backtrack the course to see if he'd left any traces of his passage, but in the dark on unfamiliar roads, I wasn't feeling too good about MG's chances. The deal was that everyone had passed through but Charlie and that he should have passed through in the time that had elapsed, thus the concerns. As mentioned above though, MG called me and said he'd found him and that Charlie was ready to call it a day, so that crisis was averted and everything was fine from that point onward. I ended up getting into Grinnell in the middle of the night, about 2:30-ish, and I felt a great sense of accomplishment. No snafus, no unplanned rerouting, the cues were spot on, and if anyone got lost, (and there were a few that did), they all knew it was their own mistakes that caused their issues. Now all there was to do was to wait and see who could finish the route. I'd done my job, and I felt it was the very best I could do. I sat on the tailgate of my truck, despite the cold, bone chilling East wind, and drank my last beer to celebrate. This was a big deal for me. It was "my finish line" for a challenge I set before myself bounding down a gravel road in David's Element a year beforehand. I didn't need anyone to "celebrate" with. It was a "quiet victory" and it was a very satisfying moment for me. I won't soon forget that night. So, with that done, I thought maybe I could catch a few "z's" before the finishers showed up after dawn. That never happened. I ended up being awake for the duration, which turned out to be a nice, pleasant time with friends. The finish, as the year before, was at the end of a road near the high school. It was supposed to have been in Lion's Park, right next door, the year before for V7, but Craig Cooper of Bikes To You kind of changed that for me and I continued to do the same for V8. It worked out real well, actually. So, the last thing was the drive home. I was beat. I had been up for a full 36 hours and driving home on the highway was getting really sketchy. I pulled off on a gravel to relieve myself and as I did, I found that I perked right up. I ended up driving about 60 miles on gravel back home. Why not? 60 miles more was a drop in the bucket to what I had already piled on for gravel mileage for the weekend! The Summer of 2011 was spent mostly doing other stuff, and I left Trans Iowa thoughts by the wayside. Unfortunately, I missed doing the Dirty Kanza 200 that year, an event I had been trying to get ready for, but I did go to Texas and ride in the El Paso area where I busted up my knee pretty badly! Well, my determination to elevate Trans Iowa from the perspective of logistics and execution was still there, and by late July I was already mapping out a course and by the second week of August I was ready to announce the event. By this time I was pretty excited to get the ball rolling. I actually had some discussions with some trusted Trans Iowa friends about moving the course start and end from Grinnell. Things like going further Westward in Iowa were punted around, and even a course that might encircle Des Moines was considered strongly. In the end, I decided that from a gravel road perspective doing Trans Iowa out of Des Moines would not work since the counties of that area had paved darn near every road leaving little to choose from. 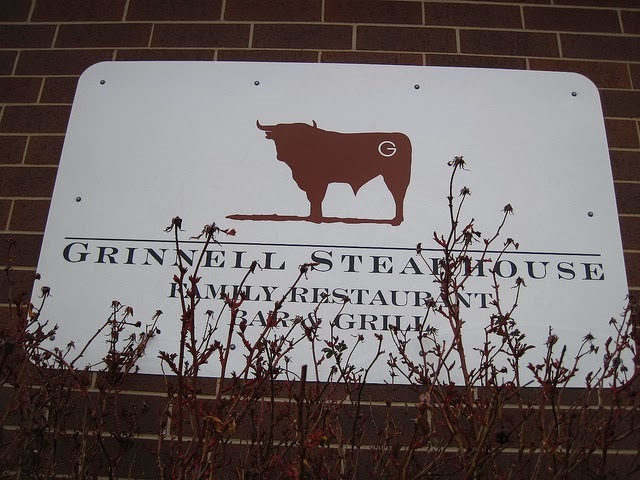 I ended up landing back on Grinnell, but it wasn't for want of trying something different! So with that decided upon, I had asked Jeff Kerkove to design another header, which he did. It was up for about two weeks when I received an e-mailed letter from some lawyers to "cease and desist". Whoops! I ended up having Jeff cook up another header pronto! The trade show season interrupted recon starting until October, but I got out there and did a huge chunk of it on my own. Going along much of the proposed "Des Moines" based route I had worked on from the Summer, I was driving in territory far from Waterloo, and in an area I'd never been in before. It was a lot of fun from that standpoint for me. The second run of recon found me driving alone again in late November. I sussed out the run in to Checkpoint #1 and got lost which added a really cool section towards the end of the event. Registration happened shortly after this and all spots were filled up with about 15-20 folks over the limit which were placed on The Waiting List. I still had a big ol' chunk of the course to recon, and I didn't know when I'd get to it. Winter held off for the most part and the days rolled by. December passed, and we were in January with this big chunk of the course not finished up yet. I was getting pretty anxious. Finally, on January 7th, 2012, I did an over 300 mile day and finished off a major goal. That was to get the recon bagged to the point I could format cue sheets. It was a super long day, but Trans Iowa was on the right track. I had detailed notes on turns, intersections, and possible trouble spots. Nothing had ever been done like this for a Trans Iowa before. Once the cue sheets were formatted they were sent off to be proofread and in late March the course was driven by my "Checkmates", Wally and George. We found a road closed! I had to reroute, but in the end, we had a lot of fun and almost got Wally's rig stuck in a B Road just Northwest of Grinnell. Oakley came on board with prizing, we had Grinnell's awesome support again, and all was lined up for another spectacular running of Trans Iowa. Would the weather hold out? That was the only question mark going in for me. The cue sheets were spot on and done, the roads double checked. I was confident there would be no mistakes from my end on T.I.v8. Breadwinner Cycles is a frame building concern from Portland, Oregon and was started by two-time Trans Iowa winner and frame builder Ira Ryan and his partner, frame builder Tony Pereira. They debuted their Breadwinner Cycles brand at the North American Handmade Bicycle Show, (NAHBS), and they will be back this year again showing a couple of new models. One is dubbed "B-Road". It'll be interesting to see just how the name is used here. On one hand, this could be a "650B road bike", and on the other hand, it could be a reference to the minimum maintenance roads in Iowa called "B Maintenance Roads", making one think it may be a gravel road bike design. My guess? Both! Their will be several "new" things popping up on the radar screens of gravel road enthusiasts soon, and perhaps this Breadwinner model is one of those things. I already have been tipped off to another thing that will be announced Saturday and will have a connection to Trans Iowa. (You'll have to wait till Monday to find out here.) UPDATE: See announcement here. The growth in gravel road related product seems to be continuing unabated, and I suspect it will rankle some feathers, give fodder for the punter's blog postings, and fuel the keyboard jockey's angst out there. 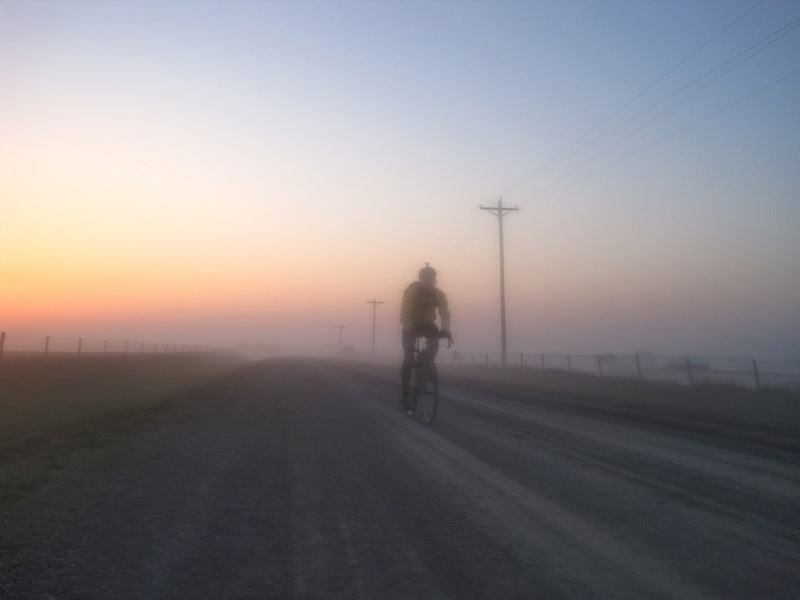 The thing is, the growth in the participation in gravel road riding, as I see it from my seat, is still rising. 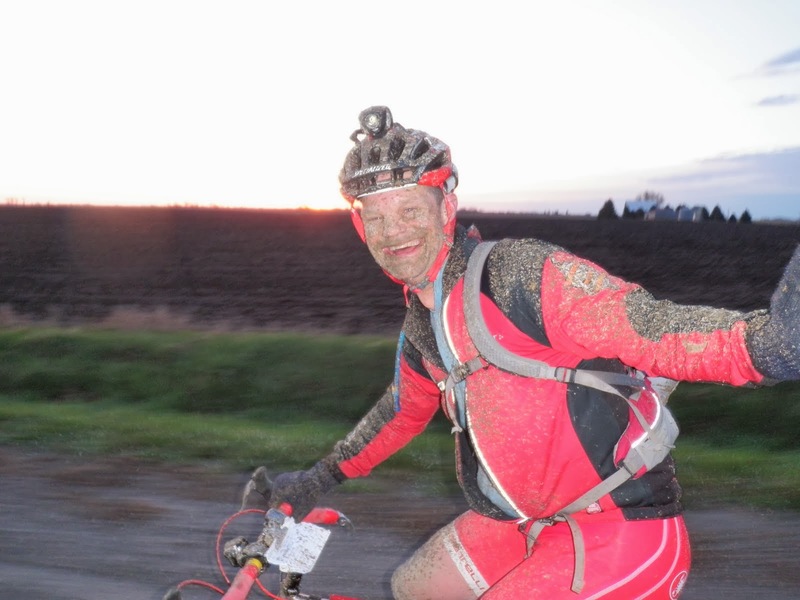 Events are posting bigger attendance figures, and I have been getting new submissions for the Gravel Grinder News calendar on a regular basis for months. On the order of about 3-5 events per week over the past three months, as a matter of fact. So, people will have some backlash to this stuff, but it doesn't negate the reality of it. 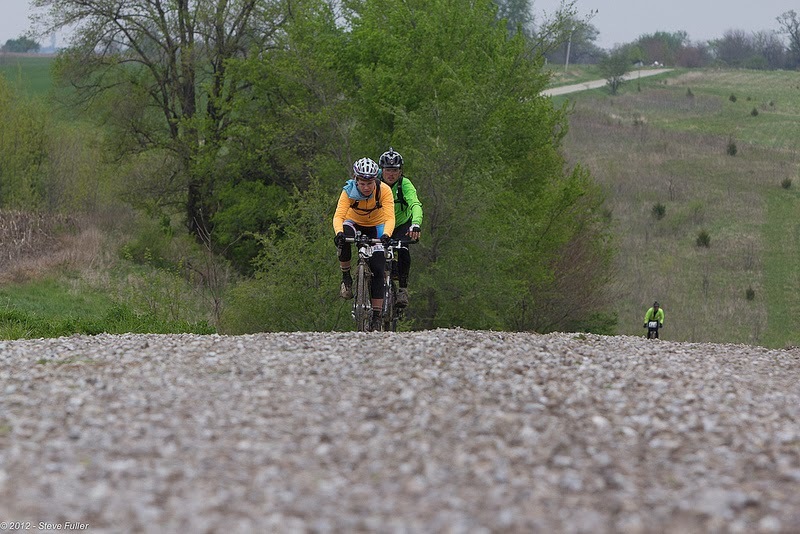 Gravel road riding is popular, the events are growing and increasing in number, and the bicycle industry is going to see if they can capitalize on that. Would you expect anything less than that? I wouldn't. I have started to fire up the Trans Iowa v10 machine again. There is a little over two months to go, and there is much to get organized yet. I have the Grinnell Steakhouse lined up again. They provide Trans Iowa with a free venue to hold the Pre-Race Meat-Up and in return I deliver warm bodies that will eat and drink at their establishment. It's been a very beneficial relationship for both parties for the last four years. My job now will be to contact each racer and get a head count on meals, what the menu choice will be, and to communicate the meeting details via e-mails which should start going out next week. This has also worked to serve the secondary purpose of finding out if folks on the roster are actually going to show up. That helps save costs on my end in both time and money. I also will be doing Trans Iowa recon with my two cue sheet checkers, Wally & George, in late March. This will make sure of the clarity of the cue sheets and whether or not they are correct, or need to be changed due to road closures. The side benefit here is I get to see how the roads are coming along. This Weekend: I have the final four posts in the "Trans Iowa Tales" series going up and then the weekend posts will be reserved for the current Trans Iowa coming up. The Frostbike report will go up Monday, and maybe there will be a couple of posts, depending upon the events going down. UPDATE: 45NRTH announces a fatter Dillinger. Stay tuned, otherwise have a great weekend and ride your bicycles! What will pop up on the screen this year? Frostbike is happening this weekend up in Bloomington, Minnesota. Yes......I will be there. I should be haunting the TC area from about Friday afternoon till sometime Sunday when I will sink back Southward to Iowa where I belong. This has become something of a yearly tradition for me. I do not keep count of such shenanigans, but I should say I've been to Frostbike almost every year for 10 years or so by now. Anymore I just figure that sometime in mid-February I'll be heading up to the Twin Cities for some geeking out on bike stuff, and more importantly, to see some great people. Let's just say that Frostbike has been mostly about people, goofing off, and maybe getting a bit of news here and there along the way. Hey! Whatta ya expect from a guy that has been frozen out of the mountain bike trails, and has been hand shoveling piles of snow for two or three months? A guy has to let off some steam now and again. But this time I think Frostbike just may be a bit heavier on the news side of the equation. Yes.....I do know about a few things, but those things alone would not constitute my feeling that this time I just might be busier tapping out keyboards instead of kegs. Fat bikes obviously will be something of note, as will the attendant componentry. I think we'll see some non-fat bike stuff on the hardware side and, of course, gravel tidbits. I understand All City has something coming out, (maybe that disc brake edition of the Macho Man), and I'm sure there will be some surprises. Stay tuned for a full report on all the goings on here Monday. Anyway, we got the band, as it was when he played on it, back together and we played for his "Celebration Of Life" ceremony. It wasn't a funeral, really. A funeral wouldn't rock as hard as this gig did. That said, I found it to be a tough gig. I seem to have been a bit too close to this emotionally than maybe I was anticipating. That said, I made it through and everything went just fine despite myself. This guy was one of those special folks. A person you'd never forget, if you'd have known him. He was that sort of a character. But beyond this, I often find it is at these times when I am reminded that things like wondering if there should be a fat bike class in races, if "gravel bikes' should be a specific design or not, or if enduro is stupid or not, doesn't matter at all. It is just fluff. Meaningless, really. Love, Life, and Living it to the fullest extent. Relationships. Being a great father, friend, husband, and human being. The snow is piled taller than a 29"er tire! No school yesterday as we got about 4 inches of fresh snow dumped on us. I stayed home with my two children to take care of them through the day. We watched it snow all morning, ate lunch, then shoveled for an hour or so. In between things, I managed to mount up my Planet Bike Cascadia 29"er fenders on the Fargo. I have to drill a hole into the rear fender yet at the brake bridge, because the Salsa has a fender mount there, but it faces downward, toward the fender, and the Cascadia fender uses a bracket to work with a bolt that would go through the brake bridge 90° to how the Fargo's braze on is aligned. Bah! I zip tied it on for now, but I will drill that out and use a small bolt when I get the bike to work some day. But beyond that, this is just needing a sealant refresh and I will be done for the season with the maintenance on this ol' girl. My plan is to do some slop-season gravel rides on this until things firm up enough to move on to these skinny 32's I'm supposed to be testing. These rides need to start soon too. Time is running short to get ready for the Renegade Gents race coming up in the beginning of April. Gave the ol' girl some much needed love. The Salsa Cycles Fargo I've had around since 2008 has been my go-to gravel exploration rig and is a bike that I've just always felt immediately comfortable on since I acquired it. That's why I've been rather loathe to retire it, and why should I? It's a perfectly good bicycle. Well.......as long as everything is in running order, that is! I have been teaching a mechanics class at the shop where I work the past two Saturdays. It was a hands on, tune up/maintenance class. For an "example bike", I brought the ol' reliable BMC "Orange Crush" bike the first week. This past Saturday I brought out the Gen I Fargo. I knew it was rather dirty and in need of some love, but I did not know how badly in need it was of this maintenance! In the class we checked over the bikes and made any necessary adjustments. My ol' Fargo was in pretty sad shape! 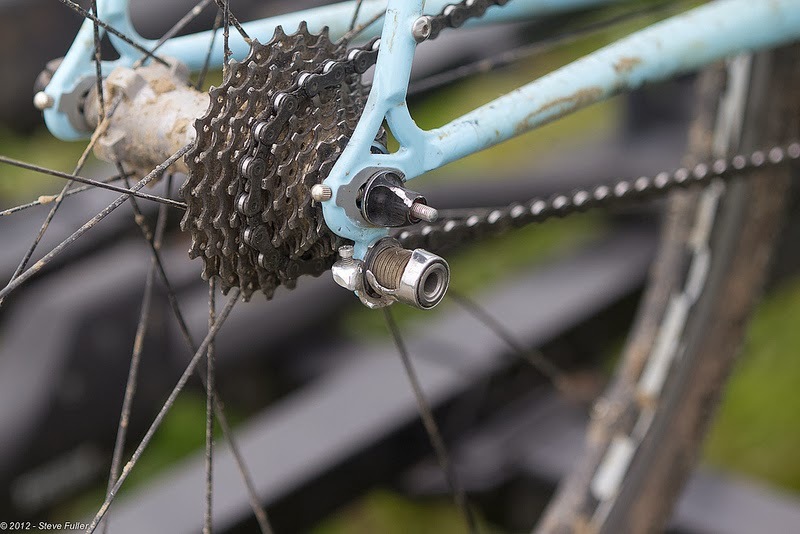 The chain was shot, the cassette, having seen duty on several bikes, was surely just as bad, and I had been wanting to swap out the crank's chain rings for a better ratio for some time. I also noticed that the rear section of derailleur housing was very badly cracked. Wow! I had no idea this bike was so much in need of some maintenance. It was a good "example bike" all right. A perfectly good example of a bike that needed some lovin'! Hey there Dave Z- I am your old cranky-crank! We also had a 36T ring, and it was a middle. The old crank set I was using was a double with a 44T and a 28T granny. The 44T was just too much sometimes and dumping into the 28 was just too severe. This was most obvious at the Odin's Revenge ride last year. If I used a 42/36, with a 22T bailout granny, it might actually make more sense for my gravelly needs. Kind of a lower ratio cyclo cross set up with low geared back up. Anyway, I figured I would give it a try. A new 11-34T Shimano cassette was found at the shop, a new chain, and this new crankset, with another of my stockpiled UN series bottom brackets to make it all work. Things went together okay, but my OE Shimano XT front derailleur didn't work with this set up. I figured a road triple would have to be sourced, since the Fargo is down tube, bottom pull routed. However; upon further inspection at home, a DynaSys 10 speed front was found with a low mount, and it worked perfectly with my friction shifting Retroshifter. Done and done! It was over. Trans Iowa V7 was done, but I had a "Dirt Rag" story to write, sponsors to thank, and some emotionally charged situations going on that seemed to put the endurance factor of Trans Iowa v7 on much longer than I imagined. There was the tension between David and I, my buddy MG was ticked off, and I had just about reached my limits in terms of being able to take any more. There was only one thing that fueled my desire to do another Trans Iowa- that was my complete and utter determination to put on a flawless Trans Iowa. Before the event was even done, I had silently vowed to myself that I would take Trans Iowa on and dominate the logistical and promotional parts of the event and show how it really could be done. I knew it could be way better. But there were things that would need to be taken care of. Difficult situations lurked in the future. In the short term, I had a tremendous outpouring of support from the riders in the event for the most part. That really helped a lot. Secondly, and I cannot remember exactly how it went down, but some of the struggles that David had been having were coming to light and I had a better feel for why things went awry on his end before the event. Shaking an exhausted Charlie Farrow's hand. ".....you know, most folks just have no idea how it almost all came unraveled. I won't go into that here. Just know that this Trans Iowa was as stressful as T.I.V3 was, and from my perspective, the event is considered one of the most difficult things I have gone through in a long time. To have it go as well as it did is great, but I am not celebrating. I'm just glad it is over...........I am tired and emotionally drained"
Later in the Summer I received an e-mail from David that said "....I quit". It really didn't say why, but I found out a lot more about his situation that Summer. He had been working 15 plus hour days for weeks on end in the winter, (which explained why I had not heard from him), and he was majorly stressed out due to cutbacks in his department. Trans Iowa was probably not real high on his list of concerns. Then he lost his job, or quit, or something, but in the end he got a job with a geology/mining concern and moved himself and eventually his whole family to the island of Fiji! I just wish that back then he could have shared his struggles and let me take the load, but he didn't, and then it didn't matter anymore after that June e-mail. I was on my own, and I was already making new plans to get a Trans Iowa V8 going. In the meantime, MG and I made amends, and he actually made plans to volunteer for a checkpoint for V8. I had a couple of friends throw in their hats to help out if needed. So with my determination, and some encouragement from others, a new version of the event was planned. There would be a complete recon before Winter. There would be a review of a final draft of the cue sheets by someone else other than myself, and I would get someone to actually drive by my cues a month or so out from the event to make sure the cues made sense. Finally, I would drive the first 100 miles the day before the event to ensure there would be no last minute snafus again. It was a tall order, but I was going to do it this way or I was going to cancel doing the event. Time would tell how it would all work out. Next: The recon and planning takes shape for a V8. So with everything in place and ready to roll, we were set for the Meat-Up once again. It went smoothly with the check in and waivers signed, along with the media releases, (a first at Trans Iowa), and David and I ran the meeting without a hiccup. 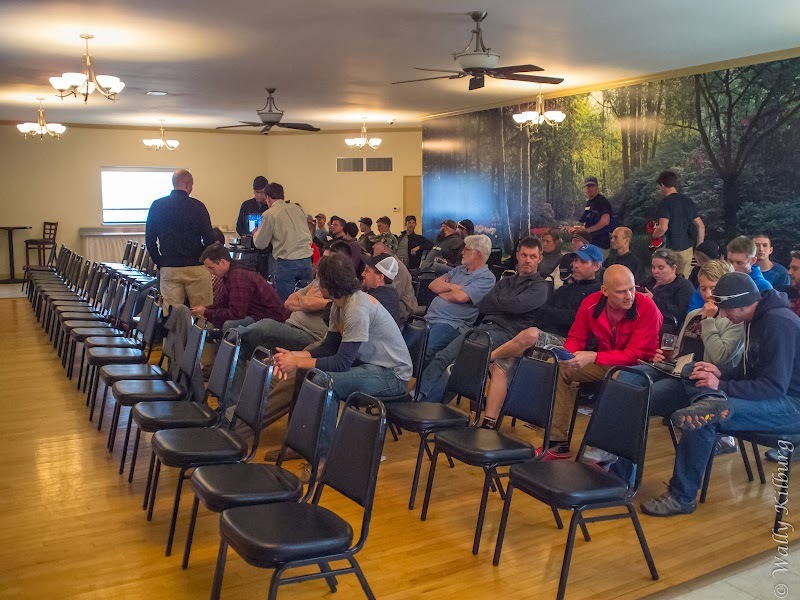 I introduced Jeff Frings and he had been busy talking with a lot of the racers that evening, many of whom appeared in "300 Miles Of Gravel". After the meeting we headed down to Bikes To You where the shop was open a little later for an "Oakley Swap Meet" and we had a couple beers before retiring to the motel. I can't really remember anything too exciting beyond that. We did get a record number of starters, (76), and a record number of rookies and women starting for V7, which probably can be attributed to our raising the field limit to 100, and the attrition of that number wasn't as dramatic as it had been in years past. Of course, that record stood for only two years as it was broken in V9. I won't spend a lot of time on stuff that is covered in the film Jeff Frings made of this event. I recommend checking it out though. I will only give you all a couple of behind the scenes stories not told on the film, or not really told clearly. This next remembrance is a key event during T.I.v7, and I did write up a bit of this on the blog back then. It has to do with the "snafu" right out of the gate during the event. David and I were in the Element, and I gave the command to make the next Left, but when we reached it there was a road closed sign! Panic ensued, and we suddenly were on a mission to re-route the event probably 10 miles after the start. Riders would be showing up at any minute! We staked out the final corner. Going straight made the riders go into a B Road, but we routed to the left. The stake and flag were next to some higher weeds, and well.......the riders went straight into the B Road! This caused major confusion, time wasted, and riders had to stop to figure out where to go. Later on riders reported the corner was not marked, but David and I clearly remembered marking it. It was what it was, but this part is still a mystery to this day. Furthermore, I had Steve Fuller drive the route a week ahead of T.I.V7 and the road closed during the event was still open. This whole incident precipitated my running at least 100 miles of Trans Iowa courses the day before the event since then. So, that put a lot of riders in arrears, and then a big West wind came up and really put the hurt on the riders. Several did not make the checkpoint in Baxter. I felt somewhat responsible for not being on top of that, and the plans were turning in my head as we rolled past Baxter to go on North and East to checkpoint #2. On the way, we rolled through Montour where a house was on fire and the fire department was there trying to douse the flames. It was kind of a surreal scene, as I recall. The way to Checkpoint #2 was largely course that I had reconned or set into cue sheet draft ahead of the event. There was really not much drama or problem with any of that until we went on past Checkpoint #2 into the evening of the first day of T.I.V7, and on to David's part of the cue sheets. We had another re-route, but I felt okay with it. However, just North of Belle Plaine, there was a mighty confusion where we realized that there were two roads with almost the exact same names running North/South separated by two miles. We even got snookered by that. Then we marked the intersections in question and went into town for a sit down supper at Pizza Hut, as I recall. Anyway, back on course, we found other confusing signs coming out of town that were not well described on the cues. It was very frustrating. Going down the road further into the night, we were both getting tired, and I was internally getting a bit upset by the lack of detail on the cues and was wondering how I would approach that in the future. But eventually we both decided to pack it in and get a bit of rest back at the motel. I don't know if I slept an hour or whatever, but at about 4:00-4:30am, the cell rang and it was my good buddy MG, who was in the race, and he was ticked off about becoming lost several times. The cues were off, and he was lost. I was pretty alarmed by this. Remember, I had already thought things weren't what I would have done, so I was very, very concerned. I suggested to David that we needed to back track the course to find the 20 riders we knew were still in the event. There were some tense moments on the road when my mind, which had been turned inside out with anger, worry, and trying to read cues backwards, decided to shut down for a bit. I finally got it back together though, and we went onward. We started seeing riders, of course, but we needed to keep chugging along. We did stop and talk with a couple of groups that were gathering up their companions to go to the finish. All were in good spirits and generally had no complaints. That wasn't the case with riders 19 and 20 that we found though. These would end up becoming the only two left out that would not finish that day. So it was that David and I were not at the finish line to see Dennis Grelk come in. I regretted that, but we were stoked to have Dennis be the champion that year. The rest of the 17 riders came in, and the last was Janna Vavre, our very first women finisher of a Trans Iowa. David and I couldn't have been more proud. Where Do The Old Components Go?